I went to Goa many times during the 1980’s and early ‘90’s, but never visited the capital, Panjim. In those days my main concern was to find remote and undeveloped beaches and the idea of spending time in yet another busy Indian city didn’t appeal to me. Seeing Panjim for the time in 2008, I realised that I had made a mistake. Goa had been a Portuguese colony for 350 years – at least 150 years longer than India had been a British colony. Besides the number of Goans who had been converted to Christianity, the Portuguese had left a very definite imprint in terms of Goa‘s architecture and this was most obvious in Panjim. Even in 2006, 45 years after the Portuguese had departed, their influence was still very much in evidence. On arriving in Panjim from Maharashtra, my first reaction was: this isn’t India. The budget hotels were located in an area called Sa Tome, and as luck would have it, this was one of the best preserved areas of classic Portuguese era houses and shops, replete with columns, arches, wooden doors and red-tiled roofs. ‘Best preserved’ needs some qualification: some of the buildings had been beautifully restored and others were in an advanced state of disrepair. Both were attractive in their own way. I got a room in a small, two-story hotel in a narrow alley called the Somia. The room was on the second story and on a corner. It had shuttered windows on two sides and a high sloping ceiling of tiles supported by wooden rafters. Between 2 and 5 pm that room got so hot that not even the ceiling fan which had only one setting – hyper manic – was enough to counter it. On my second day in Panjim, I caught the local bus out to old Goa. Old Goa was the original capital of the colony and obviously, from where the rest of the colony inherited its name from. Like Panjim, it lay on the Mandovi river, only further inland. In 1510, the Portuguese sailed down the Mandovi and took old Goa from the Moslems. Two hundred years later, they shifted their government to Panjim. In the interceding two centuries, old Goa became the so-called ‘Rome of the East’. A large number of churches and convents and seminaries were built where local Goans were trained to become priests or went into convents and monasteries. When the Portuguese shifted their seat of government to Panjim, old Goa became purely the spiritual centre of the Catholic religion in Goa. Anno 2006 and old Goa was a kind of historical graveyard. The days of its being a ‘Rome of the East’ were well in the past. Most of the cathedrals, convents and churches were in the hands of the India Historical Survey department and visited mainly by tourists. 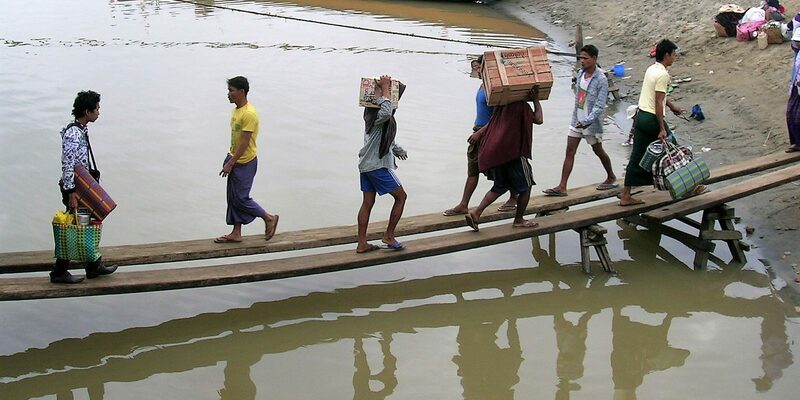 However once a year, from November 23 to December 3, it became the destination for tens of thousands of Goan pilgrims. The spiritual hero of the Goans was St Francis Xavier. There were many images of Xavier around, but the most common one depicted him wearing a white frock over a long black cassock and looking upwards in an attitude of dedication bordering on entrancement at a crucifix he was holding in his left hand. He had short black hair and a clipped beard and his legs were slightly bent, as if he was a tall man trying to make himself look smaller (maybe this was to suggest humbleness). This image of Xavier could be seen everywhere in Goa: on the walls of hovels as well as stately homes; in the small Portuguese churches nestled among the palm trees; and on signs and advertising billboards. The name Xavier had been adopted by many Goans as either their Christian or Surname. Just around the corner from the hotel Somia was a ‘St Francis Xavier General Store’ and a small eatery which called itself ‘Xavier’s’. But the penultimate example of the Goans’ worship of Xavier was once a year when they descended in hordes on old Goa to commemorate Xavier’s death in 1552. This was a major event in the calendar of every Goan, along with Easter and Christmas. For ten days, thousands of pilgrims from all over Goa made the trip to the Basilica of Dom Jesus where the mortal remains of Xavier lay inside a glass and silver case perched on top of an elaborate, three-tiered, marble mausoleum. That I was in Panjim at this very time was purely coincidental. When I caught the local bus out to Old Goa, I was expecting to be just one of many foreign tourists. I only realised that something was up when I arrived there and was met by the sight of masses of thronging people – Goans, not tourists – and lines gaudy makeshift stalls of bamboo and canvas, and contingents of khaki-clad Indian police. Arriving in old Goa, the first thing the visitor sees are the three main cathedrals in old Goa, of which the basilica of Dom Jesus is one. This was on my left as I got out of the bus. It was a dark structure built from the red-brown stone which is so common in Goa. There was a massive tent canopy next to the church and milling beneath and around it, were crowds of pilgrims. From there also came the sounds of someone talking through a loudspeaker system and intermittent bursts of singing. Next to the tent canopy was a very long line of pilgrims snaking its way into the entrance door. Far away on the right, at the end of wide open lawn, were two cathedrals which were very big and very white and so close together than from a distance, they looked like one structure: these were the Se Cathedral, and behind it, the Cathedral and convent of St Francis of Assisi. I decided to visit them before attempting to do battle with the masses of pilgrims swarming around the Basilica of Dom Jesus. These two cathedrals were easily the biggest I had seen anywhere in Asia. I wandered around inside them pretty much on my own. There were few other visitors and as such it formed a stark contrast with the scenes going on over at the Basilica of Dom Jesus a few hundred metres away. The experience of being alone inside those old cathedrals brought with it a powerful feeling of deja vu. The high ceilings and towering altars, the old paintings of biblical scenes (which had somehow survived the centuries of heat and humidity), the painted, carved wooden figures of Mary and Jesus, and the gravestones on the floors, took me back to the many times I had wandered around aimlessly in cathedrals in southern Europe and Mexico. Finally, it was time for the Basilica of Dom Jesus. Taking my place in one of the now two long cues wending its way into the Basilica, the first thing I noticed was how well everyone was dressed, the men in shirts and trousers or suits, and the women in what were clearly their best dresses. It was hot. The cue moved steadily, but slowly. The pilgrims were from every age group, from children and teenagers to the elderly and the very old. Some of the pilgrims were Hindus with red dots on their foreheads; the women wore saris. This was a Goan event and not just a Christian one (and in any case the Hindus already had so many gods that adding Xavier to the list was not an issue). It was impressive, given how many people there were together in one area, how little noise there was; people chatted quietly or whispered. This was a solemn event. St Francis Xavier arrived in Goa in 1540. He was a Spaniard and a close friend of the Ignatius Loyola (now Saint Ignatius) the founding father of the Jesuits. The Jesuits arose in the wake of the schism between the Catholics and Protestants. Chief amongst the Protestant grievances against the Catholic church was its corruption. Catholic priests were notorious were taking bribes, drinking and whoring. The Jesuits represented an attempt to reform Catholicism from within without causing a break. Men like Xavier emphasized the need to get back to the basics and reject all forms of worldly attachment. Put simply they were zealots and puritans who took strict vows of chastity, poverty, soberness, helping the poor and sick – and going out into the world and saving the souls of heathens. It was their missionary zeal which made the King of Portugal an early supporter of the Jesuits. At this point in time, Portugal was the foremost trading and seafaring nation in the world. Whilst it was the lucrative spice trade which first drew the Portuguese to Goa, their motivations for empire were more complex than simply the desire for profits – unlike the Dutch and English who came after them. The Portuguese wanted to win converts for Christianity as well as line their pockets. When they arrived in Goa and drove off the Muslims, they found in the local Hindus – who had been cruelly oppressed by the Moslems – a large pool of willing converts. From a fort town, old Goa quickly developed into a church town to the point where one day became known as the ‘Rome of the East’. In their drive to combine religion with capitalism, to build a Christian as well as a trading empire, the Portuguese ran into a problem: a point came when they had too many overseas possessions and not enough priests. Despite the glory of working amongst the heathen and winning over converts for the Lord, many priests were not too keen to renounce the safety of their lives at home me for the hardships and dangers of malarial jungles and tropical heat in far off places. As a Christian zealot incapable of being corrupted and single-mindedly dedicated to God, Xavier was an ideal candidate for work in the Portuguese empire. When Xavier arrived in Goa he was 35. Within 10 years of his arrival, he was dead. During that time, he travelled extensively through Asia, working to spread the good word and save souls wherever he went. Given the extent of his travels, one almost suspects that behind his missionary zeal was a simple case of wanderlust. He spent little time in Goa: as far as India went, he spent far more time in the south, preaching to lower caste Hindu fishermen. In any case, his favourite country was not India, but rather, Japan. He died of a fever on the island of Sancien just outside Canton whilst trying to gain entry into the gigantic untapped market for souls in China. During his life, Xavier hardly qualified as a likely candidate to become Goa‘s future patron saint. This status was only acquired after he died. Xavier’s body was buried in Sancien along with four bags of lime, which normally should have eaten away his flesh pretty quickly. Some months later the decision was made to dig up Xavier’s skeleton and transfer it for burial in the Portuguese colony of Malacca. Lo and behold, when the body was dug up, it was found that the flesh not been eaten away and furthermore, that he ‘had all the appearance of a living man’. Fresh blood ran from an open wound. The body which refused to rot was duly buried in Malacca, but several months later, the governor had it dug up again so that he could inspect it. To his amazement Xavier’s body was still in perfect condition. ‘Such a life-like body’ decided the governor, ‘could not be consigned to the grave’, so he put it on a ship and had it sent to Goa. In the meantime, rumours about the miracle of Xavier’s un-decayed body spread in Goa long before the ship transporting his body docked. A Jesuit priest sailed out to meet the ship and confirmed the miracle himself. He went back to Goa and spread the news and by the time the body arrived, huge crowds gathered to meet it. The Viceroy, suspecting that the body had been embalmed, had it inspected by his chief medical officer, who reported that the intestines were still present, that the body had not been embalmed and that the blood was still quite fresh. This was the story then of what was termed the ‘uncorrupted body’ of Xavier. If during his life he was in-corruptible, then after he died he was un-corruptible – and the latter proved to be far more important for the Catholic Church and the Goans than the former, because it fell into the category of a Supernatural Miracle. As I joined the cue wending into the Basilica of Dom Jesus, I joined a long and historic stream of pilgrims who for the last four centuries had travelled old Goa to see and venerate the uncorrupted body of St Francis Xavier. But there was more to the story of the Incorruptible Saint. Back in Europe, whilst the uncorrupted body of Xavier was being exalted as Goa’s very own divine miracle, the letters Xavier had written home during his travels were bundled together and published. In a Catholic Europe demoralised by the success of the Protestant reformation in northern Europe and which was hungry for heroes, Xavier’s letters came like a gift from heaven. Here was a man who had bravely performed God’s work in distant and exotic places, saving souls and extending the Catholic empire after it had been so seriously challenged closer to home. Xavier’s letters were translated and became bestsellers in all the countries of southern Europe. They were read from pulpits and quoted by kings and queens and priests and cardinals. A thriving industry in turning out fake Xavier letters arose and after a while it became difficult to know which were the real Xavier letters and which weren’t. In 1622, Xavier was canonised. Goa was now home to uncorrupted remains of a Saint, a man directly associated with God himself. But the Saint became the victim of a perverse kind of souvenir industry. Bits and pieces of his body were hacked off in the frenetic hunt for sacred relics. The small toes were cut off, one by one, so that only the big toes were left remaining. The right arm was cut off at the elbow and sent to Rome. Later, the rest of the right arm and the shoulder-blade was cut off and divided up and the relics handed on to various churches spread throughout Portugal’s religious empire. Following this, all the internal organs were also removed and souvenired. The writer of a popular Goan account of Xavier asserted that it was the effects of this sacred souvenir hunting which spelt the end of the uncorrupted nature of Xavier’s body; it began to dry out and ossify so that it resembled what it is today: a finely dressed up mummy, like something dug out of an ancient pyramid. God had sent a message to humanity in the form of a body which refused to decay and humans – indeed, the priests themselves, who were supposed to be the earthly representatives of God – had sabotaged the miracle with their avariciousness and short sightedness. It was another version of the human failings which led to the crucifixion of Jesus. Alarmed at the effects of the souvenir hunting, the governor of Goa had Xavier’s body sealed in a locked lead coffin, where it remained from 1700 to 1860. During this time, the body was not exhibited. When it was finally exhibited again, an estimated half a million pilgrims turned up. From this time on, Xavier’s dried out mummy was placed in glass case and perched on top of the marble mausoleum where it lies today – so that no one could have any direct contact with it. Under the tent canopy were hundreds and hundreds of metal fold-out chairs. The ceiling of the canopy was covered in brightly coloured designs and supported by lots of blue and white poles. At the church end of the canopy was a long counter covered in gold cloth and behind stood several important Church dignitaries, dressed in all their finery and wearing long hats. On the counter was a microphone and next to the podium were big loudspeaker boxes. Eight masses were given every day during the festivities, most of them in Konkani but three of them in English. As luck would have it, I turned up at the tail end an English mass. 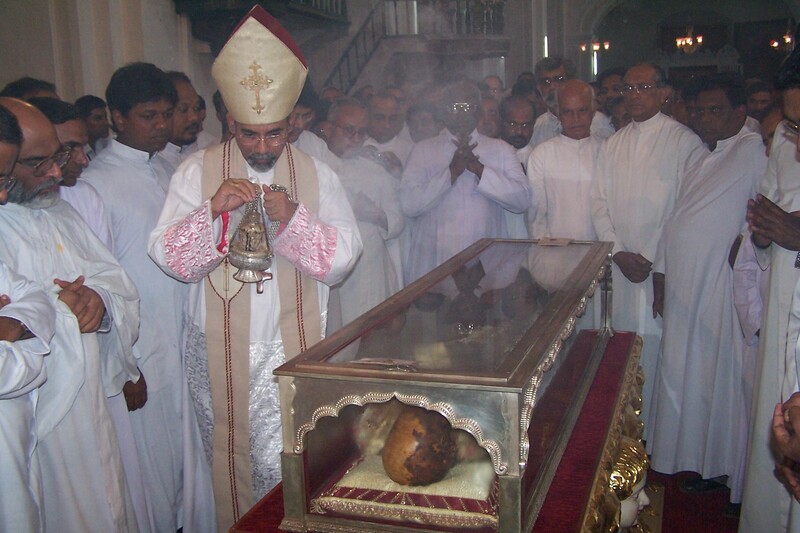 1- St. Xavier’s uncorrupt body was a great gift to the church and the people of Goa. 2 – Before leaving for the East, Xavier had told the Goans: ‘I am leaving Goa and will not come back again, but instead my body will come to Goa. 3- St. Xavier loved Goa and this is why his body had been preserved from corruption. I stared at Bishop Mendes in disbelief. Never before had I heard so many barefaced lies told by a person in a position of authority. The lies were so blatant they made the lies of a politician look tame in comparison. I looked at all the well dressed people around me, the thousands of them. Did they seriously believe that Xavier had had any real attachment to Goa? Did they seriously believe that before he left, he had told them that his body would come back to them? And for that matter, did they seriously believe all that banter about the uncorrupt body which refused to rot? Was the human need to believe in miracles, in the supernatural really so deep-rooted and profound, that it paralysed the human capacity for reason? Later however, after the mass was over, something else occurred to me: the veneration of Xavier was a part of a Goan tradition, a part of what it meant to be Goan. It was a source of cohesion. The mass veneration of Xavier was an event which reaffirmed one’s identity and one’s place in the world. In an India dominated by caste, ethnicity, language, region and belief, identity was a crucial means of survival. The veneration of Xavier was a part of a process of reaffirming a particular identity, this in a country where if one did not do this, one would be swamped by someone else’s identity. In this case the identity process went beyond the conventional lines demarcated by religion, which is why both Hindus as well as Christians felt a need to honour and worship Saint Francis Xavier. On the bus back to Panjim, I got talking to a woman who spoke good English and was obviously well educated and intelligent. She told me: ‘Xavier died in 1552 and four hundred and fifty years later, he’s still here in Goa‘. She said this with pride, as if this very fact on its own was a real clincher. Xavier’s Egyptian style mummy, minus an arm, toes and innards, symbolised something permanent in a world which was too obviously impermanent.